In Colombia time has a different meaning, a different structure. This has been noted already by writers and travellers, but for a composer it is particularly exciting, since it opens up a whole new perspective on time perception and manipulation. Colombians do not have a linear perception of time – one event after the other – as we usually have in Europe. Time in Colombia is more like a sort of fabric, where each interweaving thread represents a single event. Instead of building time as a series of events following each other, Colombians maintain a parallel perception where many events are kept together. Delay and multithreading are the key concepts here; events are kept in a sort of memory buffer and dealt with according to external requirements, all at the same time. Instead of completing one event and going on to the next, Colombians advance by small or big leaps through many events at the same time. This attitude towards time is puzzling at first, but once you get used to it, it is utterly fascinating. A group of friends might decide to visit the family of one of them living in a finca, a house in the country. The plan is to leave on Tuesday afternoon. They duly meet on Tuesday to leave, but they eventually leave only on Friday morning. A number of parallel events have been unfolding, and the trip to the finca has been delayed by three days, but for all of them it is only a bit ‘later’. They, or their expecting host, have no concept of a missed appointment nor they feel the need to reschedule the trip. Time, simply, has stretched and the ‘visit to the finca’ event with it, like some sort of elastic entity. 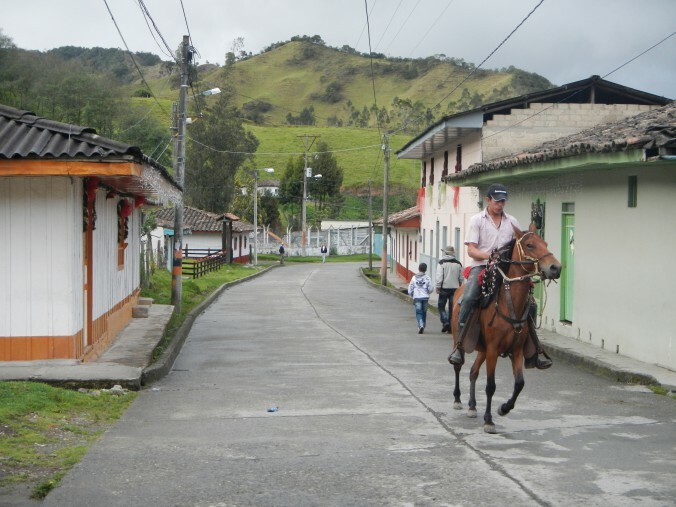 The continuous shifting and rearranging of events in time and the ability to deal with it, the ability to maintain a parallel perception of many crisscrossing events – is, I believe, one of the main reasons for the amazing creativity, emotional intelligence and adaptation skills of the Colombian people, especially those living in rural areas. It is easy to see a musical parallel: instead of one or more fixed timelines governing a sequence of musical events or objects, each event has its own timeline, expanding and contracting according to the behaviour of other concurrent timelines. Yesterday night I went to a concert in the main church of Salamina, amidst the mountains in the coffee-growing region of Caldas in central Colombia. It was a “banda sinfónica juvenil”, bringing together the best players from all the local wind bands (there are 44 of them from every village in the region). The quality of the playing was amazing. 80 kids aged 14 to 18 played a mixed repertoire of classical music arrangements and Colombian folk music, with unerring precision, great intonation and an infectious sense of rhythm. The most interesting pieces in the programme were by Victoriano Valencia, considered the best Colombian composer of music for “banda sinfónica’. Victoriano’s arrangements thread a fine line between traditional roots and innovation – especially formal and harmonic – without falling in the easy trap of emulating the jazz-derived idiom and sounds of North American big bands. I found his music highly original and very well scored.